New Delhi : The Minister of State (Independent Charge) of Environment, Forest and Climate Change, Anil Madhav Dave, has urged the students to be sensitive towards wild animals and the elephant, in particular. Addressing a gathering of school students on the occasion of World Elephant Day here today, Dave said that sensitivity has been a hallmark of the Indian civilization. He added that students must shun use of ivory products and other products made from animals’ skin. The Environment Minister said that like all animals, the elephant teaches us several lessons. He pointed out that elephant’s trunk is extremely sensitive and teaches all of us to be sensitive. The Minister added that while the trunk of an elephant is extremely sensitive and can even lift a needle and on the other hand has the strength to lift heavy logs of wood. “The elephant has an extremely sharp memory. Similarly, students also must be able to fully memorise a line or a chapter from a book”, the Environment Minister told the students. Dave said that an elephant is one of the five most intelligent animals. The Minister also administered a pledge to the school students on the occasion. 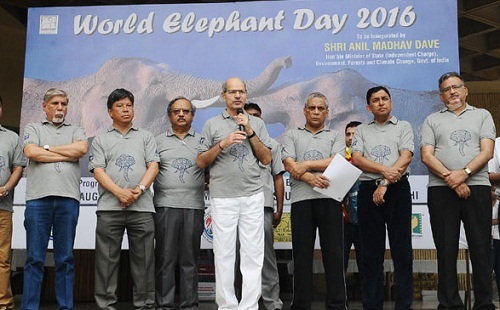 The students joined hands for elephant conservation and also undertook a conservation march. The school students also participated in a slogan-writing competition and a quiz competition were also organised.